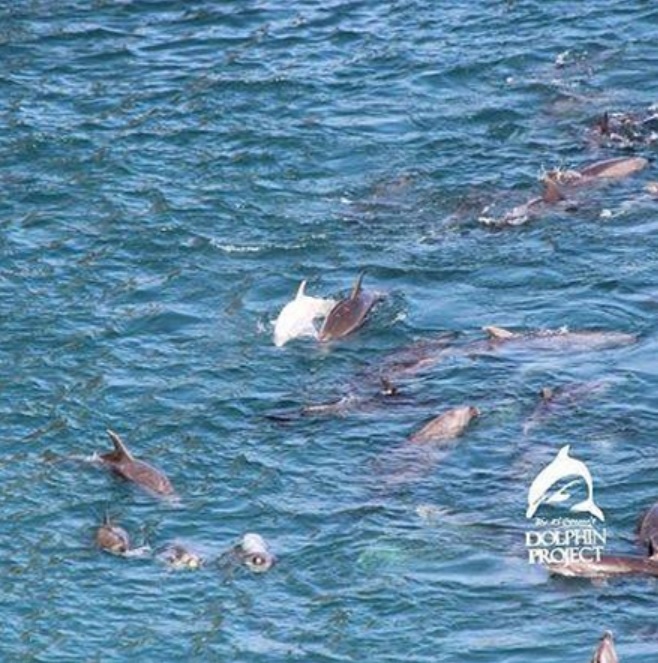 January 17, 2014 a mega pod of bottlenose dolphins was driven into Taiji “The Cove” in five large sections. 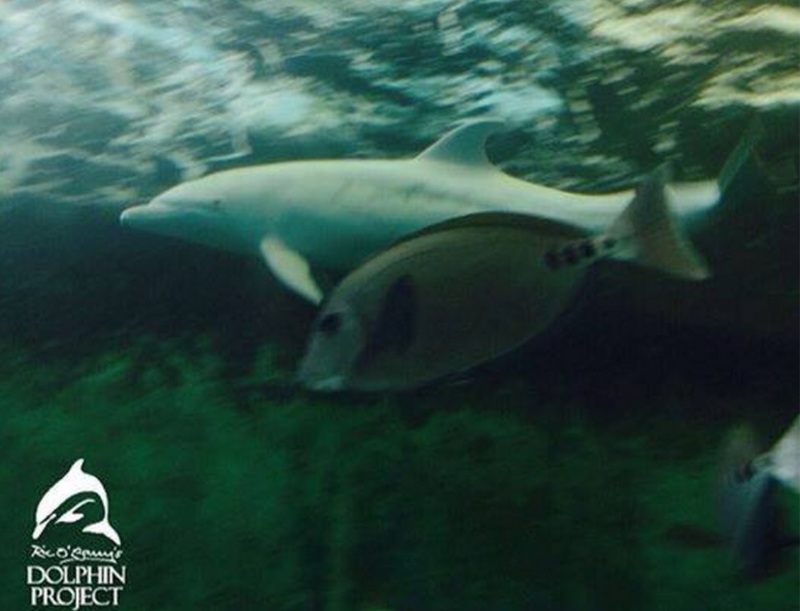 Among the dolphin community was a mother with a rare albino baby dolphin who today is know as “Angel”. Throughout the day and night as Angel and her family awaited the chaos and violence of the coming days she hugged her mother as though she knew the remaining hours of her life with her family and community was going to be taken from her. The following morning when the hunters and trainers arrived their first victim would be Angel. 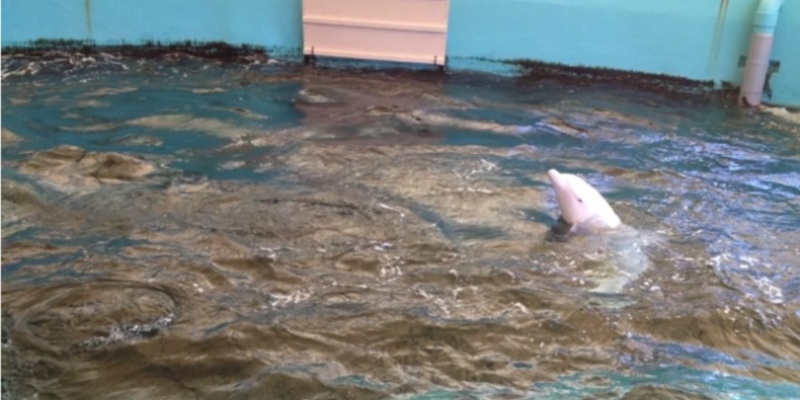 They quickly separated mother from baby, wrangling the rare albino dolphin onto a skiff, taking her directly to the Taiji Whale Museum only minutes from the killing cove where she remains today in a tiny tank harassed by humans and other dolphins. While some say her mother committed suicide, the chances of slaughter were equally as possible. After Angel’s capture three days of torture and hell remained for the 250 plus super pod as the juveniles were captured, their parents and the injured slaughtered and the unwanted driven back out to sea with only a few surviving. In her article “Taiji Whale Museum Slapped with Lawsuit Over Albino Dolphin Angel” Melissa Cronin quotes the head of the Taiji Whale Museum: “The aquariums head Katsumi Hayashi, acknowledges his facility routinely denies entry to non Japanese activists such as members of the Conservation Group Sea Shepherd(SSCS)”. What the Japanese Association of Zoos and Aquariums Member(JAZA), Katsumi Hayashi, does not go onto explain is that The Dolphin Project and Australia for Dolphins are in no way affiliated with SSCS. “Action for Angel” is an independent campaign spear headed by Australia for Dolphins, The Ric O’Barry Dolphin Project and Save Japan Dolphins all organizations working hand in hand with Japanese people who oppose dolphin drive fisheries. Angels would catch the worlds attention as she was ripped from her mothers side, and her pod destroyed! Join Action4Angel now! 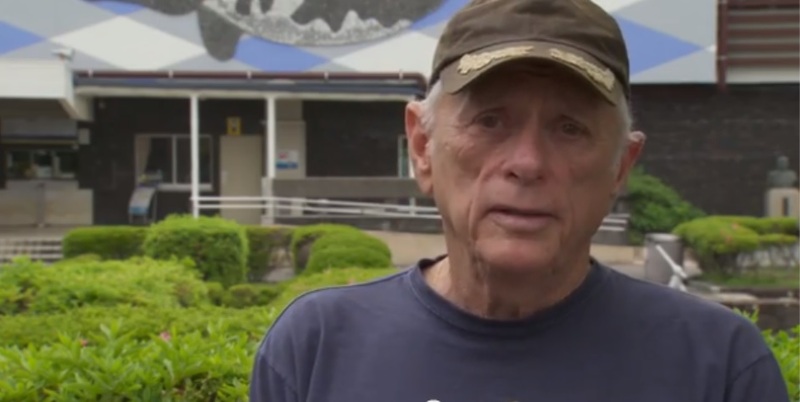 “The Taiji Whale Museum has refused entry to Ric O’Barry, Sarah Lucas knowing they oppose the cruel dolphin drive, and abusive treatment of dolphins at the Taiji Whale Museum and in the bloody cove. “What we would like to achieve is the same right the Japanese Public has access to the building so we can get inside and see how Angel is doing the rare albino dolphin that was captured. We would just like to see her. They don’t want us to do that. They are hiding something and they are breaking the law in the process of hiding that something”. Take action now.. Go to #Action4Angel.org and get involved! You are her only hope. 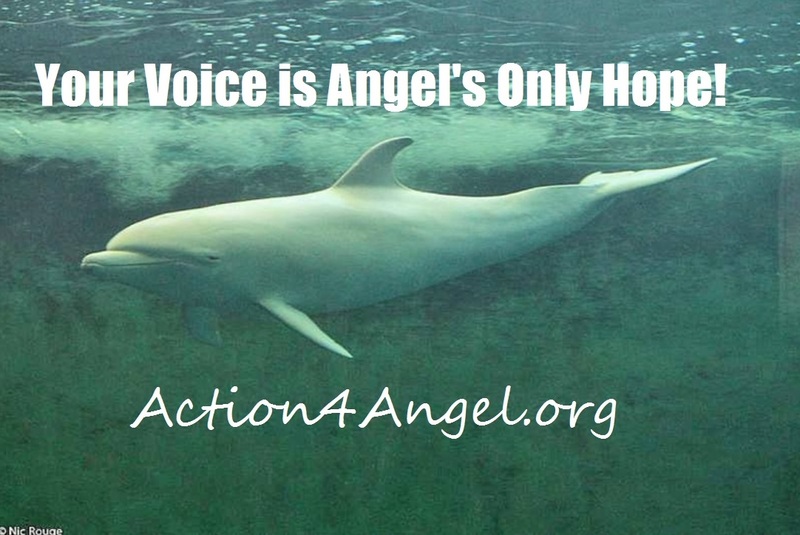 #Hope4Angel and all captive dolphins. This entry was posted in Cetaceans, Dolphins, Whales and tagged Action4Angel, Hope4Angel, Ric O'Barry, Sarah Lucas, Taiji Whale Museum, the Cove by Kirsten Massebeau. Bookmark the permalink. Can we not garner support from people with deep pockets – actors, singers, etc., and raise the half mil needed to “purchase” angel so that we can rehab her and set her free? Thank you so much Ric for all you are doing. We are behind you all the way!